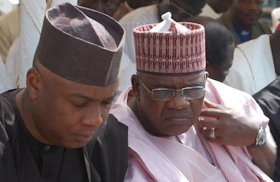 The ruling APC is very worried that some of its senators are romancing Senate President Bukola Saraki to get his support ahead of the 9th senate. It is believed that any APC senator with just 10 supporters can work with the PDP senators through Saraki and emerge the new senate president. Consequently, the APC has been sending people to beg Senator Danjuma Goje. Some former governors are mounting pressure on their former colleague, Senator Goje, to accept President Muhammadu Buhari’s choice of Ahmad Lawan for Senate president. The All Progressives Congress (APC) former governors appreciated the “cautious approach adopted by Goje to his aspiration without ruffling feathers but they felt he should defer to the President”. The ex-governors have sent a delegation to Goje to reconsider his position. Although two of them were with Goje on Saturday for what was termed “a social gathering”, it was unclear whether they were the ones who spoke on behalf of their colleagues. 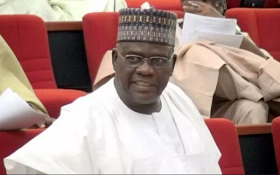 A former governor, who pleaded not to be named, said: “It is true we are trying to avoid cracks in APC over the Ninth Senate President and some of us have met on the President’s choice and how to prevail on Goje to sacrifice his aspiration. “I can tell you that some of us have opened talks with him. We are talking to him; we are mounting pressure. We also decided to send a delegation to him.